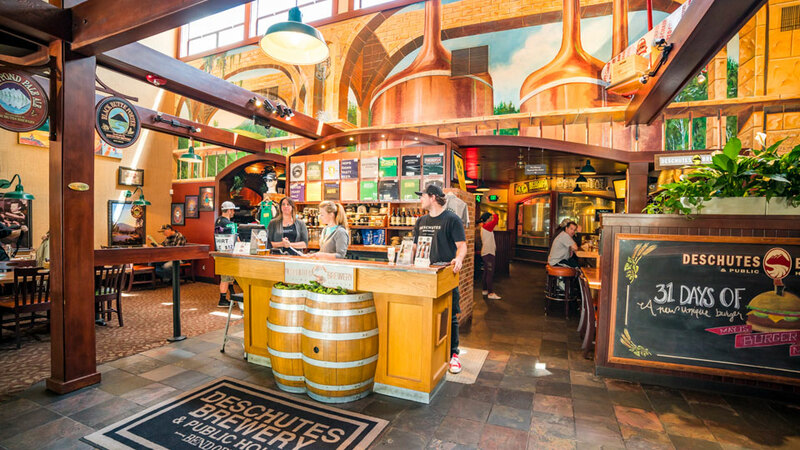 By far the biggest brewery in Bend, Deschutes Brewery is family and employee-owned, with a mission to profitably deliver the finest beers in the world and cultivate extraordinary experiences. They offer free daily guided brewery tours starting from their Tasting Room, available to book online. With six year-round brews, four seasonal, a special “Bond Street” series of seven beers inspired by their original pub on Bond Street in downtown Bend, six Reserve series brews, and two collaborations, Deschutes is available in 28 states, Washington D.C., British Columbia and Alberta, Canada. They have pubs in both Bend and Portland, along with tasting rooms in Bend and their latest brewery in Roanoke, VA. The original Public House in Bend has been a downtown fixture since 1988. Their beer-centric menu features fresh ingredients, mainly locally sourced, and some made with spent grain from the brewing process. The Portland pub features both Deschutes mainstays and an exclusive selection developed and brewed on site. With tasting rooms on both coasts, you can try some direct from the source.